You try hitting the nail with the claw side of the unwieldy tool. It doesn’t go very well. Then you beat on the nail with the handle. That doesn’t work either. Finally, you figure it out. You whack the nail with the hammer’s head and in she goes. The point: Having the proper hardware isn’t enough. You’ve got to know how to use it, too. The same goes for golf. You know the ball is supposed to fly toward the target. 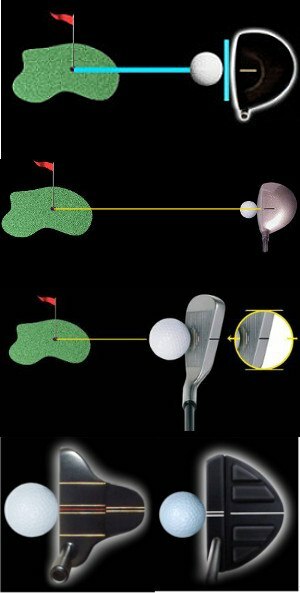 You understand how to swing the club so that its face strikes the ball. But if you want the ball to travel directly at the target – not just in the general direction, with 20 yards of leeway on either side – you must aim with precision. With its patented Shot Accuracy Technology built into every club, Thomas Golf gives you the tools to correctly align each shot – from tee to cup. Thomas Golf clubs feature an alignment indicator which, when used properly, lines up the clubface to the target with deadly accuracy. If you wait until you’re set up over the ball to align the clubface, chances are you’ll miss the mark by at least a little. Yes, you’ll come much closer with a Thomas Golf club than with a club that doesn’t have an alignment guide. But your eyes can still play tricks. Standing a yard or two behind the ball, locate your target – the spot where you want the ball to finish, not necessarily its starting line. Be specific by choosing a small part of the fairway or green. Visually align the ball with the target. Some golfers hold the club vertically in front of their dominant eye so that the shaft bisects ball and target (much as you’d plumb-bob a putt). Find an object or spot, such as a divot or broken tee, on the direct line between ball and target. This is your aiming point and should be within a few feet of your ball. Closer is better. Step to the shot, set the club behind the ball and point the alignment indicator directly at your aiming point. Bingo! The clubface is perfectly aligned. Line up your feet, hips and shoulders and you’re ready to go. Now that you’ve got the tool and the technique needed for dead-on aim, it’s hammer time!